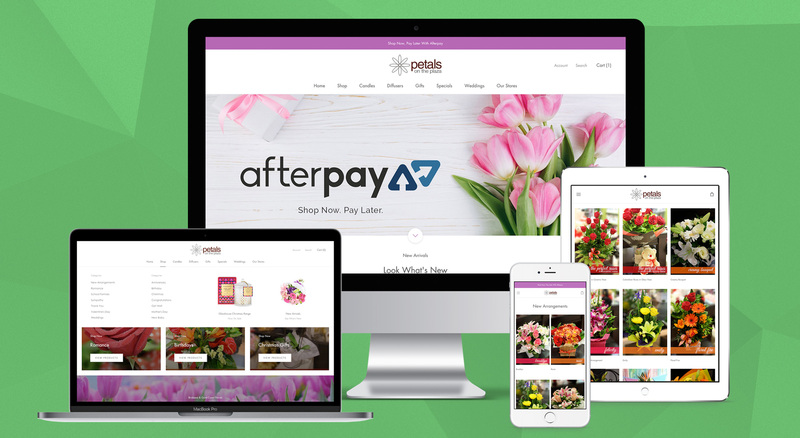 OnePoint recently had the pleasure of launching a fresh new website design for southern Queensland florists Petals On The Plaza. Operating three stores across Helensvale, Coomera and Springwood; Petals On The Plaza also sell their fresh flower arrangements online and provide same day delivery to Gold Coast and Brisbane suburbs. With 2018 coming to an end, OnePoint caught up with owners Greg and Angie to establish new goals for their online store and what’s in store for 2019. A modern website design was constructed for the Shopify website to present a more streamlined shopping experience. The new design is not only more visual but easier to use for mobile devices – which accounts for a whopping 84% of all traffic. OnePoint have added all the bells and whistles to the new Shopify site including page transitions, Afterpay integration, delivery date options, customer registration and account sections, live Instagram feed and slideshow & gallery management tools. Since re-launching the website, we’ve been impressed to say the least. We’ve seen conversion rates almost double and abandoned cart rates fall from 28.7% to 3.9%. Whether you’re looking to spoil someone with fresh flowers, or treat a family member or friend to a Glasshouse Candle or gift; browse the new Petals On The Plaza website online now. If you need to speak with a website designer about your website or online store, please don’t hesitate to call us on 07 3444 0045.